On Saturday afternoon at 4:27 and 39 seconds, 18 miles beneath the surface of the ocean and 23 miles west of Ferndale, a vast slab of the earth's crust known as the Gorda plate slipped vertically against the much larger North American plate laterally along a vertical faultline, releasing years of accumulated pressure in the form of a 6.5-magnitude earthquake. For a fraction of a moment, no one knew. Then customers standing in line at Staples in the Eureka Mall looked up in unison, suddenly curious, like they were trying to recognize a tune on the radio. And then the floor made a sudden lateral lurch beneath their feet, as if the whole building had been perched on a flatbed truck when the driver popped the clutch. Instinctively, everyone's knees bent for balance and their bodies went rigid, heads swiveling madly like startled animals. The ground quivered and rumbled briefly, but before anyone could move, the second jolt hit. "Angry" is how many would later describe it, like being rear-ended. It slammed the building violently, sending everything into cacophonous motion -- lights popping, shelves sliding, office supplies crashing to the floor. The young checker's eyes went wide, and she sprinted for the door, followed closely by the throng. A panicked man face-planted just shy of the automatic door, then popped up immediately and kept running. Crowds poured from Blockbuster, Rite-Aid, Michael's and Winco, flooding into the parking lot where streetlights swayed like ships' masts. Some people screamed; others, the seasoned earthquake veterans, walked calmly over the speed bumps or casually pulled out their cell phones. Some turned and stared back at the buildings, perhaps expecting them to fall. Others jumped into their cars and filed into the eastbound procession on Harris Street. Inside the Henderson Street branch of Papa Murphy's Pizza, some smiled at the first few shock waves. They had all the characteristics of an average 3 or 4 quake. The windows rattled, the adrenaline level rose a touch. There was a split-second pause when it seemed like it was over, and then everything was chaos -- the walls moved back and forth, and the building roared with sound. "Up" and "down" became variable for a few seconds, and people splayed their legs wide to keep their footing. Fear was still visible as the quake subsided. The cashier, a young woman, paced directionlessly behind the counter, her hands clutched at her chest. "I'm scared. I'm scared," she repeated to herself. All over Eureka, residents emerged from their homes and stood dazed on the sidewalks. They called out to neighbors, "You OK?" "That was a big one!" The sky glowed peach and gray, and then dimmed. A group of neighbors chattered excitedly outside their homes on a K Street block not far from downtown Eureka. A woman came out of her house with a small dog clutched in her arms and walked up the street calling out worriedly for another pet. From a nearby alley came the crash-clink of falling glass. A woman was throwing out the remains of her blown-glass collection, which had shattered in the quake. Lights came on in the houses; this block hadn't lost power. But farther up and down the street the other blocks were dark. And the other streets, dark -- except for the occasional orange flicker of candlelight in windows, revealing drunken walls where pictures clung at cockeyed angles. People came out of their dark houses. They stood on the sidewalk talking to their neighbors. Some talked on cell phones, standing on the sidewalk looking around, or hunched on their porches. On K Street, near the corner of 14th, a woman stood on the sidewalk and said loudly into her phone, "I lost all my dishes. All the cupboards flew open and everything flew out. All my dishes are broken." Her next-door neighbor pulled up to the curb and got out of his car. "Is everything OK at your house?" she called to him. He said he didn't know yet, and went up his walkway. On I Street, a woman walked quickly up and down, talking nervously to other people doing the same thing. A man came around the corner. "What's the news?" he asked. "I don't have power. I don't have radio or TV. What's the news?" 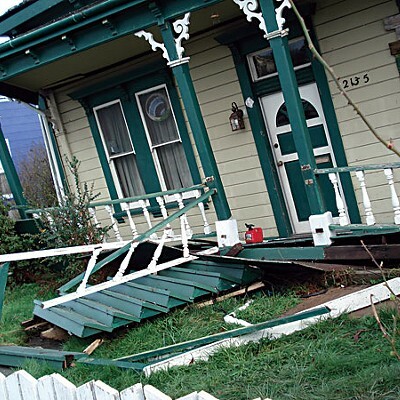 He said he didn't have earthquake insurance. Other people sat in vehicles, talking on their cell phones. A stream of cars rushed toward downtown, their headlights punching through the blacked-out streets. Many turned north on 101, maybe heading to Arcata. Some went into Old Town, which was dark. On the corner of E and Fourth Street, people moved around in the shadows maneuvering large sheets of plywood into place over the broken window of Edward Jones Investments. Inside loomed the tall, sharp-cornered bronze Hobart Brown sculpture, still standing. 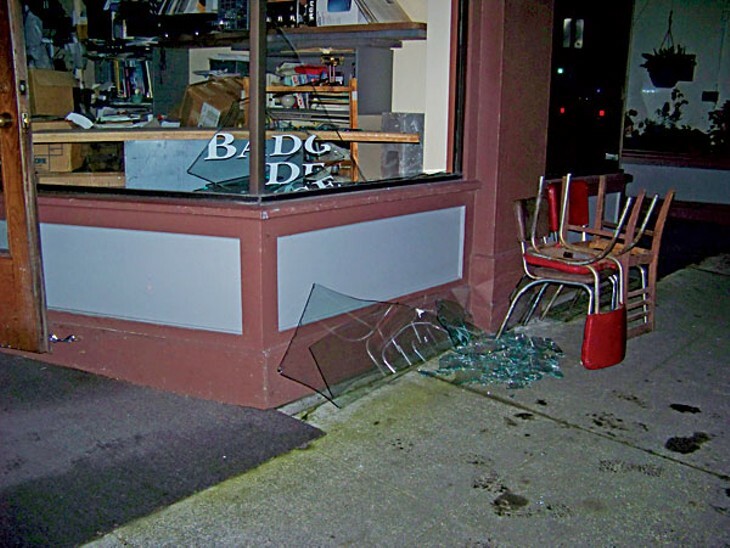 Other businesses on the block also had lost storefront windows. Herman Zwald, owner of the Badger's Den antique store, was pulling an old lamp through the shards of a window. He put it in the back of his van. Shattered glass littered the sidewalk. It might be a long night. 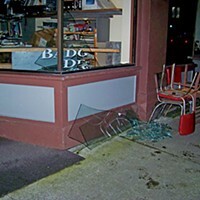 Friends had gone to find plywood, but he wasn't sure he had any pieces big enough to cover the broken window. If not, he'd stand guard ’til he could buy some the next day. White chunks of the building across E Street littered the sidewalk. 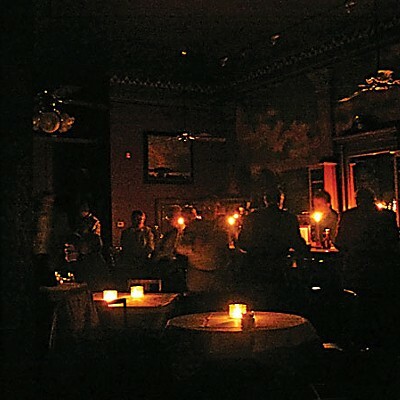 Farther down E, toward the heart of Old Town, candlelight flickered on the tables inside the empty blackness of Gabriel's Italian restaurant. Employees stood outside, looking toward Second Street and the flashing lights of emergency vehicles. An ambulance. A firetruck. Police cars. 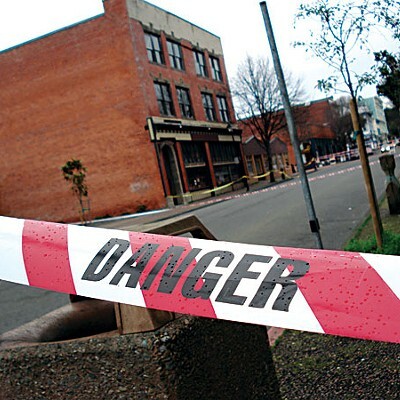 At 325 Second St., the hundred-year-old brick-and-mortar walls of the vacant Old Town Bar & Grill building had partially succumbed to the shaking. A 70-foot stretch of masonry atop the third floor of the eastern parapet had crumbled loose, sending bricks and dust crashing through the roof of the office building below. 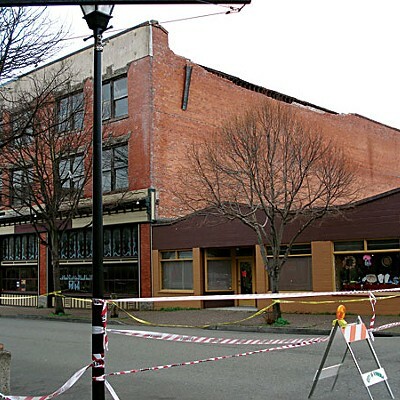 The front facade, which had partially separated from the adjacent walls during a series of quakes in 1992, had tipped further forward and come to rest at a precarious tilt, leaning out over Second Street. Caution tape was strung across Second at D and E streets, guarded by a couple of firemen talking to the ambulance driver. Nobody had been hurt, she said. A homeless person sauntered down the closed-off sidewalk and brushed past a big planter, getting a glance from the guards. Someone walked along the base of the building, shining a flashlight up at its roof to expose a ragged edge where the brickwork had collapsed. Beyond the flashing lights, more darkness. The ocean smelled close. Cars drove slowly through the dark streets. A convertible, top down and tunes cranked, made two passes down Second. Over on F Street, between First and Second, a woman stood outside the building that houses Strictly for the Birds, the Linen Closet and other businesses, staring at a large crack in the building's white stucco wall and talking on her cell phone. People strolled the dark streets, looking around. Empty restaurants. Empty bars. And then, a pocket of life. At the Waterfront Cafe, on the corner of F and First, several employees stood outside chatting in the dark. Inside, where candles flickered on the tables, it looked like the last great drinking party was underway in the festive gloom. People crowding the bar, laughing and talking and clinking glasses. A gray-haired crowd. Surely, with the power out, the cash machines would be down. Maybe older folks were the only ones carrying around cash these days. But one of the employees said it was a retirement party. The Eureka dispatch center fielded 700 calls in the four hours following the earthquake. A couple of dozen people sought treatment at St. Joseph, and one of them was admitted with a hip injury. Over half the county's homes lost power immediately. The national news started carrying reports almost instantly, and "Eureka Earthquake" became a trending topic on Twitter. Photos of wrecked shopping center aisles and broken windows from both Eureka and Ferndale -- the two hardest-hit towns -- spread around the world. The trucks of tradesmen -- plumbers, electricians, masons -- were on the move up and down H Street. Congressman Mike Thompson and Assemblymember Wes Chesbro arrived in town. 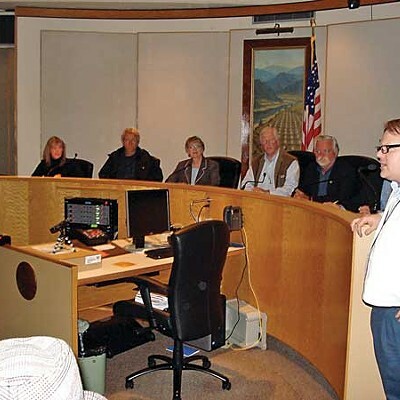 They toured Ferndale in the morning, then came up to Eureka to participate in a joint press conference with county government and delegates from the cities of Eureka and Arcata. The San Francisco Chronicle, the Los Angeles Times, the Associated Press and a Bay Area television station sent reporters. At 2 p.m., everyone filed into the chambers of the Humboldt County Board of Supervisors. The universal consensus, voiced a number of times by a number of different people, was that the county had "dodged a bullet." Going by the sheer experiential violence of the quake -- a 6.5 on the Richter just didn't seem to do it justice -- it was stunning how little property damage there was. At the press conference, Eureka Fire Chief Eric Smith attached a very rough dollar figure to the damage that his team was aware of within the city limits: $12.5 million. But they were in the early days of the assessment, and that figure was bound to grow. 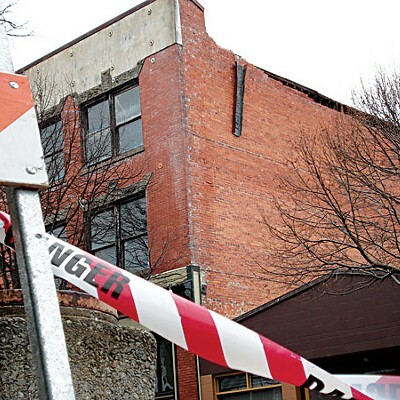 Downtown Eureka is full of old, brick structures; Smith said that building inspectors would be checking on them one by one in the coming days, after which they'd turn their attention to structures less at risk. Thompson and Chesbro pledged to assist the county in seeking disaster relief funds, if they were warranted. 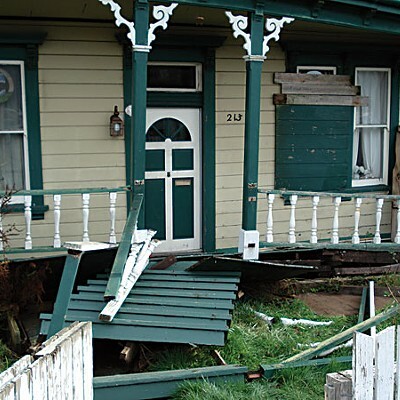 By the next day, the damage assessment had more than doubled, to around $28 million. 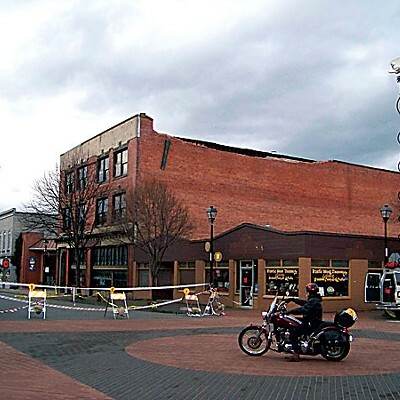 The Lloyd Building remained roped off, and fire crews attended to the facade of the Eureka Theater, parts of which were wobbling in the wind. The Bayshore Mall was still closed, as were the Eureka High Auditorium and the Ink People Center for the Arts. On Monday morning, the Eureka City Council convened an emergency meeting to discuss the fate of the Old Town Bar & Grill building. 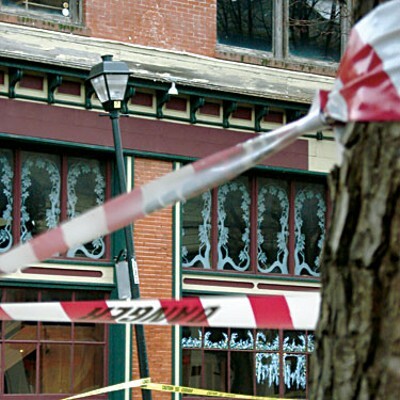 Since the quake, structural engineers and building officials had inspected public and private structures all over the city, and while a number had been yellow- or red-tagged as possible hazards, including the old Lloyd building on Fifth Street and the post office on H Street, only the Old Town Bar & Grill was identified as a potentially eminent threat to public safety. Staff recommended authorizing the current owner, Security National, to demolish it as soon as possible. A number of residents showed up to oppose the resolution, including many historic preservation advocates who argued that demolition was a "knee-jerk" response that would set a bad precedent. Councilman Larry Glass asked if patching the building was indeed possible, and Neil Penfold, a civil engineer with the city, said sure, anything's possible if you throw enough money at it. But the building has been vacant and neglected for years, he said, and the bricks used in the original 1908 construction had apparently not been culled for strength. After a brief adjournment to read and consider the resolution, the council voted unanimously, with Council member Linda Atkins absent, to approve the measure authorizing demolition. They did, however, encourage the owner to salvage the building's historic architectural features, even the entire first floor if possible. The building will be demolished as quickly as possible. On Tuesday, after a briefing on the updated damage assessment, the Humboldt County Board of Supervisors declared a state of emergency, and petitioned Gov. Schwarzenegger to release disaster funds. The Bayshore Mall announced that it was once again open for business. Eureka had lost a historic building. A family had lost a home. Thousands of windows and dishes and potted plants are gone forever, and there is more serious damage left to be tallied. Maybe much more. Just about every building around the bay has newly cracked paint, weakened joists, loosened nails -- the scars that geology leaves on civilization just to remind us who's boss.